A project to design innovative freight wagons, which is being financed by Germany’s Federal Ministry of Transport and Digital Infrastructure (BMVI), DB Cargo and VTG, is producing ‘very promising’ results. The article is worth reading in full and in my mind it could be important in the development of efficient and reliable freight trains. I remember in the 1960s, British Rail were trying to run faster freight trains and a lot of four-wheel wagons kept derailing. Research at Derby using computer simulation solved the problem and went on to lead to a greater understanding of the dynamics of steel wheel on steel rail. 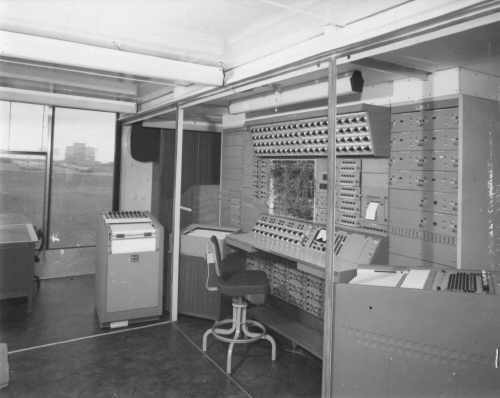 I do know that British Rail Research had one of the best tools for this job; a PACE 231-R analogue computer. This is the one, that I worked on at ICI. They were a powerful computer, which were capable of solving a hundred simultaneous differential equations. They were late 1950s technology, based mainly on electronic valves, that responded to tender loving care. But two of them working together, did the dynamic calculations for the moon landings, when linked to the digital computers of an Apollo capsule and lander. On Apollo 13, when Jack Swigert said “Houston we have problem”, it was these machines, that were used to find a way to bring everyone home. And the rest, as they say is history! In my view, after over fifty years in computing, the rescue of Apollo 13 was the greatest piece of computing ever done with an electronic machine. The second paragraph of the Global Rail News article has this phrase. feature new digital systems which optimise handling. Does this mean the Germans are worried about the handling? I do sometimes wonder, if dynamic systems are best analysed using analogue computers and the demise of the technology means the same problems keep returning in different guises. There can’t be many of us left, who’ve used an analogue computer seriously.